You can keep track of how much memory and CPU your computer is using by adding the CPU Meter gadget to your Sidebar in Windows Vista. The CPU is simply a reminder that helps you monitor your computer’s performance. This gadget can definitely come in handy to show you when you need to free up some space. Add the CPU Meter gadget to the Sidebar. When you add the CPU Meter gadget to the Sidebar, you can find and view the gadget’s information more quickly and easily. Just click the Gadgets symbol (the plus sign) at the top of the Sidebar to open the Gadget Gallery. Then click and drag the CPU Meter gadget to the Sidebar. 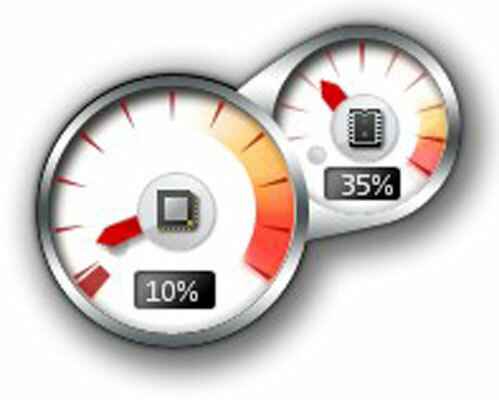 Use the readouts to monitor your CPU and memory use. CPU Usage monitors how hard your CPU is working to process various programs and processes running on your computer. Random Access Memory (RAM) monitors the percent of your computer memory that is being used. You can’t make or change any settings that you track with this gadget. It’s just a little tool that helps you watch your computer’s performance. If memory is almost at 100%, consider freeing some space. If the CPU is at a higher percentage, odds are you’ve got lots of programs running which could be slowing down your computer’s performance; consider shutting some down! If you want more detail about your computer memory usage, use the Start menu to display the Control Panel and choose System and Maintenance. The System links allow you to monitor the processor speed and the amount of RAM available.